Teachers rock! In celebration of Teacher Appreciation Week (May 8-12), we have put together a bunch of reasons why we love teachers. Why do you love teachers? Is there one teacher that inspired you? What did they do that was so inspiring? 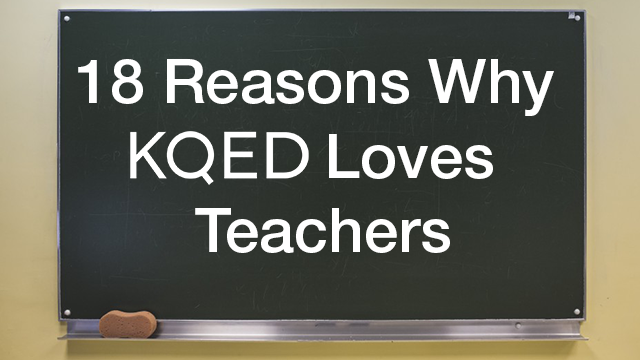 Share with us on Twitter or Instagram by using #KQEDLovesTeachers. 1. We love teachers because they show up. They listen. They inspire. 2. We love teachers because they believe students’ voices matter. 3. We love teachers because they encourage students to make their voice heard. 4. We love teachers because they provide an outlet for expression. 5. We love teachers because they support all types of learners. 6. We love teachers because they expand their students’ horizons. 7. We love teachers because they connect the classroom to what’s happening in the world. 8. We love teachers because they help students cut through the hype. 9. We love teachers because they shake things up! 10. We love teachers because they help prepare students for future careers. 11. We love teachers because they get their hands dirty. 12. We love teachers because they teach topics that matter to students. 13. We love teachers because they encourage their students to solve real-world problems. 14. We love teachers because they inspire creativity. 15. We love teachers because they are always looking for ways to spark civic engagement. 16. We love teachers because they are always searching for the best standards-aligned resources. 17. We love teachers because they share their knowledge with fellow teachers. 18. We love teachers because they never stop learning. They create spaces where kids can go and be in a positive environment where they don’t have to be afraid.